learning and life: passion, process, practice, patience and praise. This 2 times award - winning documentary film features Matty Kahn, an 89 year old woman, who on March 1st 2006 volunteered for the Never2Late project to begin learning to play the cello. The documentary film also features experts on aging, Concetta M. Tomaino and Dr. Veronica LoFaso, and an adult cello student, Anne Wigglesworth, who shared their views on the positive impact music learning has on aging and how the training helps improve cognitive / muscular function. 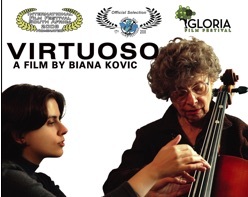 Virtuoso is a winner of the British Film Festival of Los Angeles and the South Africa International Film Festival. The film has been shown at the Sunshine Cinema, NY; Opera Plaza Cinemas, San Francisco, CA; Kendall Square Cinemas, Cambridge, MA; as well as numerous senior centers, colleges, schools, universities and film festivals such as The Waterford Film Festival, Ireland; Gloria Film Festival, Utah; Woods Hole Film Festival, Wood Hole, MA; South African International Film Festival, Johannesburg, South Africa; British Film Festival of Los Angeles, Los Angeles, CA; 92nd Street Y, NY; New York University, NY; Beth Israel Medical Center, NY; Baylor College of Medicine, Houston, TX; Cornell University, Ithaca, NY; and New York Presbyterian Hospital, NY. Virtuoso was an inspiration for the book called The Vintage Years - Finding Your Inner Artist, written by Francine Toder, Ph.D. The film was produced by Biana Kovic and the FullMoon Productions.